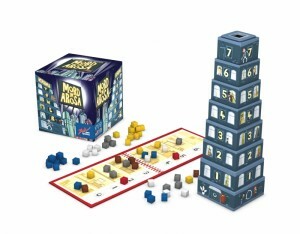 Mord im Arosa is a very unusual game. If you like pure tactics with zero luck then I doubt this is a game for you; however, if you just want a fun game that anyone can play then this will be of interest. 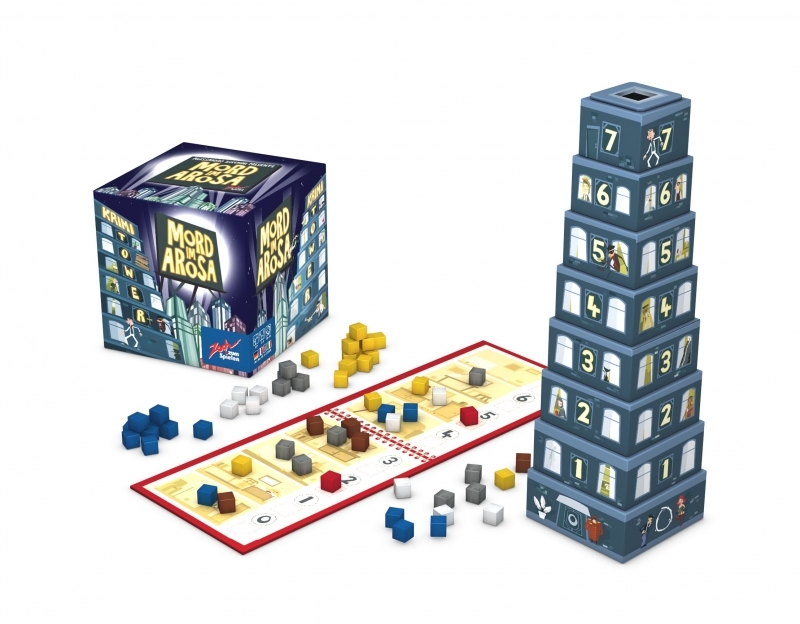 Two murders have occurred in the Hotel Arosa and the player with the least evidence against them will win the game. During the game, players drop wooden cubes (evidence) into the pyramid of card boxes that make up the hotel. There is a hole in each floor so the cubes may end up on any floor and players need to listen to them as they fall as they will need to predict which colour cubes are on which floors. At the start of the game, two red cubes get discovered showing the floors where the murders took place. These are placed on the board (showing the hotel’s floors) which will also be used to record where any evidence is found. On a player’s turn, a player can try to incriminate other players by announcing which colours they think are on a specific floor. When revealed, any players guessed correctly place cubes from their supply equal to those revealed onto the corresponding floor of the board. For each colour the player guessed wrong, the player must drop an extra cube of their own colour into the hotel. Whatever happens, any revealed cubes get recycled back into the hotel and never leave. A player can also try to cover their tracks by guessing a floor where their own colour is – if correct, they remove an equal number of their own cubes from the corresponding floor on the board. When one player has 10 cubes on the board or has run out of cubes, the game ends. Cubes on the same floor as a murder victim score 3 points, cube on a floor adjacent to a victim score 2 points, and all other cubes score 1 point. The player with the fewest points wins the game. Overall, Mord im Arosa is a very cute and very light game. Listening to where cubes land and, just as importantly, remembering which colour landed where is the core game play; however, there are some tactics to be had (who you select and where can be influenced by who has cubes on the board and where the murder floors are). I like the balance that the guessing delivers – You can guess lots of colours in one go to try and incriminate lots of other players but that increases your risk of adding more of your own cubes to the hotel if you’re wrong (and having lots of cubes in the hotel makes it more likely that they will be discovered and added to the board). I think the sweet spot is around 4 players as this gives lots of different choices and potential mixtures, but makes it a bit easier to keep better track of what cubes may be where. The 6-player games I’ve played are quite chaotic but still fun. The more you concentrate, the more educated your guesses can be but it’s definitely not a science and too much concentration will erase some of the fun factor. The rules state that if both murders are found on same floor then that is fine but I think it is less interesting because there are fewer places to score the bigger points and players tend to focus on guessing the same floors near the one murder floor. We added a house rule that says if the two murders are found together, they get split up either side of that floor, or one is placed on the floor in question and the other is placed one or two floors away (discovering player’s choice). Either way, this is a very minor negative. 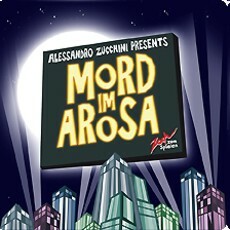 As soon as I read about Mord im Arosa I knew I would pick it up and, fortunately, did so at Spiel before it sold out. It’s definitely nothing like anything I’ve played – a good filler for more serious gamers (you’d be surprised how intense the players you thought may not have cared for the game can get) and a good game for casual and new gamers too. This entry was posted on Friday, November 26th, 2010 at 4:25 pm	and is filed under Board Game Review, Board Games, Essen Spiel 10, Mord Im Arosa. You can follow any responses to this entry through the RSS 2.0 feed. You can leave a response, or trackback from your own site.